Crossing Rome takes us back into the intriguing and inspiring first centuries of the Christian faith and the experience of the Early Church at Rome. The documentary uncovers many fascinating historical and archaeological finds that show how the cross at Rome went from being a symbol of criminality and shame to a sign of triumph and loving sacrifice. From the crucifixion to the coliseum to the catacombs, Crossing Rome takes us gently but unavoidably to what it means today to "take up our cross and follow Him." This is an outstanding program for Lent and Easter. Hosted by journalist and broadcaster Paul Heiney, the journey is beautifully augmented by reflections and music from students at the English College in Rome. British journalist Paul Heiney hosts this journey through the ruins of ancient Rome. As Heiney wanders the city, he points out evidence of the early Christians and speculates on persecutions they faced while practicing their faith. Focusing on the symbol of the cross, the host examines ancient paintings, mosaics, and statues and explores catacombs and hidden rooms that document the dangers of practicing Christianity in this pagan stronghold. Although the cross didn’t become the official symbol for Christianity until the fourth century according to interviewed historians, early depictions of crosses attest to the symbol’s power. Intercutting these scenes are choral performances and heartfelt personal testimonials from young men studying for the priesthood in Rome. Mixing a powerful Christian message with an effective travelogue, this reasonably-priced program holds interest for travelers and others. The 26-minute documentary uncovers historical and archaeological finds that show how the cross at Rome went from being a symbol of criminality and became a sign of sacrifice. Hosted by journalist and broadcaster Paul Heiney, the video contains reflections and music from students at the English College in Rome. 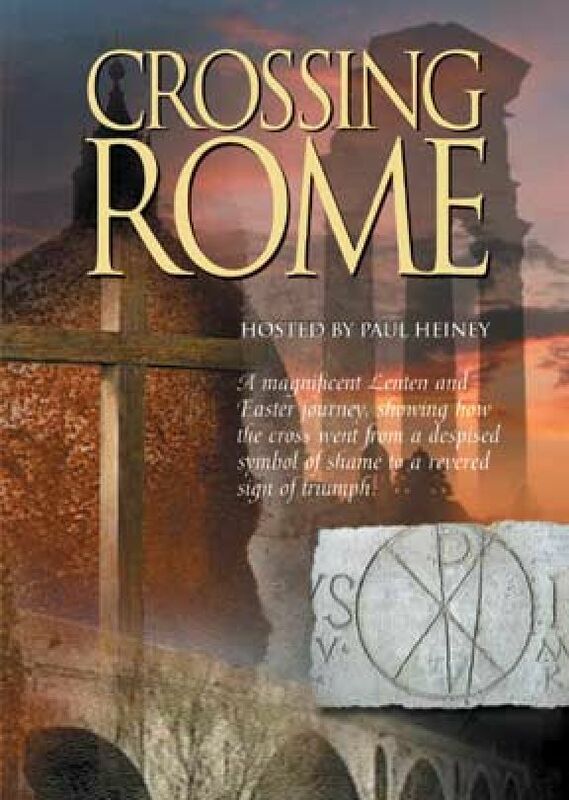 This is an intriguing look at the "cross," its history and its significance with special emphasis on the cross and its redeeming, all-encompassing presence in the city of Rome. It is an intriguing and inspiring first centuries' history of the Christian faith and the experience of the early church at Rome. Presented here are many fascinating historical and archaeological finds. They show how the cross at Rome went from being a symbol of criminality to as sign of triumph and loving sacrifice. "From the crucifixion to the catacombs, Crossing Rome take us gently but unavoidably to what it means today to take up the cross and follow him." This journey is hosted by British journalist and broadcaster Paul Heiney, and the itinerary is beautifully augmented by reflections and music from students at the English College in Rome. This is another wonderful video, both meditative and informative for Lent and Easter.